Disclaimer: This summary may contain spoilers if you have not read the first book in this trilogy. To read my review of ANGELFIRE, click here. 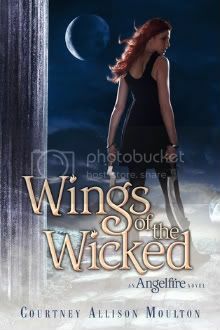 Angelfire was one of my favorite books of 2011, so I've been dying to read Wings of the Wicked for a very long time now. I was very eager to delve back into the world that Courtney created and see what Ellie and Will faced this time. Wings of the Wicked in one word: Wow. Sometimes sophomore novels don't live up to the first book, but with Wings of the Wicked nothing could be farther from the truth. This book was darker than Angelfire, but with this came an intensity that made this book impossible to put down. Somehow 500 pages flew by and yet still weren't enough. The world and its angel lore, the action, the romance...all were taken to a new level during this book. Every fighting scene was incredibly vivid, and Will and Ellie's relationship by turns sizzled off the page or made me smile ridiculously or even tear up. And Will. Oh, Will. I'm positive I claimed him as one of my book boyfriends already, but if not, let me do that now. He is swoon-worthy to the max and practically perfect in an endearing way. Then there's Cadan, who definitely surprised me in this book. I'm very curious to see how things will turn out for him in the next book. Finally there's Ellie. Despite her rough patches, she really grew into her own over the course of this book. And all of these characters are woven into a story full of twists and turns that take you on one crazy ride. It's hard to say what the best part of this book is, because I love the characters, the story, and the writing. Courtney's writing style truly makes every scene come to life and made me feel everything that these characters felt. There's also a bit of evil genius at work in this book...I'm convinced that a few scenes were in there to torture us readers (and Courtney has admitted to her evil ways...). Be prepared to lose sleep, to laugh, cry, grieve, and rejoice along with Ellie, Will, and the others. I am dying to know what happens next and will be impatiently awaiting the final book in this trilogy! Omg, I completely agree 100% with everything you stated! I looooooove this book soooo much! :) Amazing review, seriously! Nice review. I've been anxiously awaiting the release for this one ever since I finished the first one. After reading you thoughts on it I want it even more. Sounds fantastic!